When you enter this comfortable, well-designed home (2,869 sq. ft.) in Saluda River Club’s Woodlands District, you’ll be happily surprised by the bright, open interior – designed with a growing family in mind. Located at 230 Otter Passage Road, the brand new 4 bedroom, 3.5 bath home by Lifestone Residential is priced at $449,749 – and it is ready for immediate move-in. On the main floor, the builder has emphasized the elegant open floorplan which makes this home great for entertaining year-round. The only separation between the main living areas is detailed millwork on the ceilings. The family room features a gas fireplace with decorative mantle and large scenic window overlooking the outdoor living area – great to enjoy the mild South Carolina seasons. Downstairs you’ll also find a large den, perfect for an office or additional media room. The Woodlands District is one of Saluda River Club’s four distinct neighborhoods, in addition to the master-planned community’s River District, Village District and The Bluffs. The Woodlands District features impressive privacy, miles of nature trails and mini-parks, plus full access to all shared amenities at Saluda River Club such as the Village Clubhouse for adults, the Chickawa Club and Outdoor Center for all ages, and the River Launch for kayaking, canoeing and fishing. 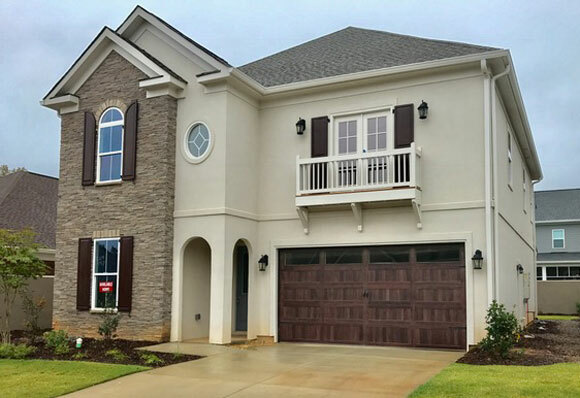 In addition to this beautiful new home, the neighborhood includes a variety of home styles that offer elegant architectural detailing, fresh design and a sense of bringing the outdoors in, right on the banks of the Saluda River. To learn more about this bright, well-crafted home by Lifestone Residential and other brand new homes currently available at Saluda River Club, please schedule a visit soon. For more information or directions, please call 803-358-3969.